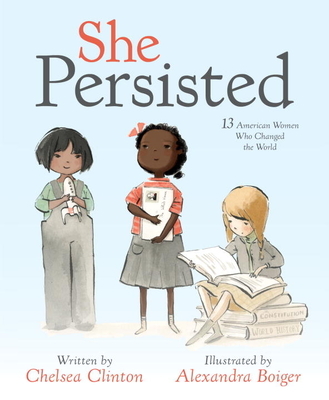 Chelsea Clinton introduces tiny feminists, mini activists and little kids who are ready to take on the world to thirteen inspirational women who never took no for an answer, and who always, inevitably and without fail, persisted. Throughout American history, there have always been women who have spoken out for what's right, even when they have to fight to be heard. In early 2017, Senator Elizabeth Warren's refusal to be silenced in the Senate inspired a spontaneous celebration of women who persevered in the face of adversity. In this book, Chelsea Clinton celebrates thirteen American women who helped shape our country through their tenacity, sometimes through speaking out, sometimes by staying seated, sometimes by captivating an audience. They all certainly persisted. She Persisted is for everyone who has ever wanted to speak up but has been told to quiet down, for everyone who has ever tried to reach for the stars but was told to sit down, and for everyone who has ever been made to feel unworthy or unimportant or small. With vivid, compelling art by Alexandra Boiger, this book shows readers that no matter what obstacles may be in their paths, they shouldn't give up on their dreams. Persistence is power. This book features: Harriet Tubman, Helen Keller, Clara Lemlich, Nellie Bly, Virginia Apgar, Maria Tallchief, Claudette Colvin, Ruby Bridges, Margaret Chase Smith, Sally Ride, Florence Griffith Joyner, Oprah Winfrey, Sonia Sotomayor—and one special cameo. Chelsea Clinton is the author of the #1 New York Times bestseller She Persisted: 13 American Women Who Changed the World; She Persisted Around the World: 13 Women Who Changed History; It's Your World: Get Informed, Get Inspired & Get Going! ; Start Now! : You Can Make a Difference and, with Devi Sridhar, Governing Global Health: Who Runs the World and Why? She is also the Vice Chair of the Clinton Foundation, where she works on many initiatives, including those that help empower the next generation of leaders. She lives in New York City with her husband, Marc, their daughter, Charlotte, their son, Aidan, and their dog, Soren. You can follow Chelsea Clinton on Twitter @ChelseaClinton or on Facebook at www.facebook.com/chelseaclinton. Alexandra Boiger has illustrated nearly twenty picture books, including the popular Tallulah series by Marilyn Singer and the Max and Marla books, which she also wrote. Originally from Munich, Germany, she now lives outside of San Francisco, California, with her husband, Andrea, daughter, Vanessa, and two cats, Luiso and Winter. You can visit Alexandra Boiger online at alexandraboiger.com.